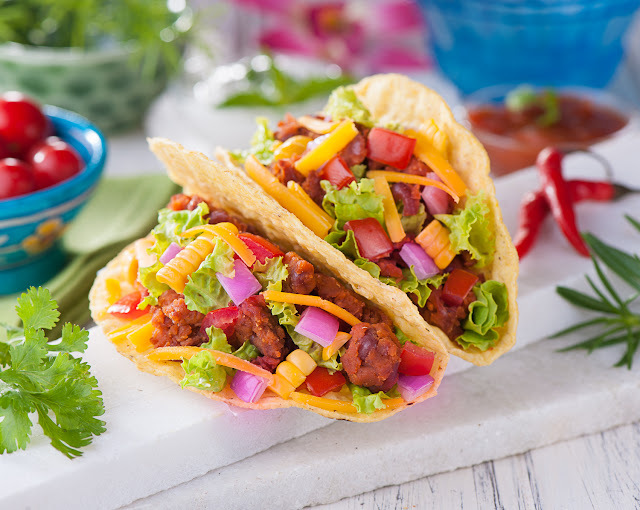 Ingredients - Taco shells - 12 No, Cornitos Refried beans - 200 g, Red onion cubes - 250 g, Sweet corn kernels steamed - 180 g, Lettuce - 100 g, Tomatoes deseeded & diced - 200 g, Salt to taste, Grated Cheddar Cheese - 150 g, 1 pack Taco Seasoning and 50 g Cornitos Chunky Salsa Dip. Assembling the Tacos – Place Shells on Taco Boat. Line the taco shells with lettuce & put Cornitos Refried beans filling inside. Top it with diced onions and Sweet Corn filling. Garnish with Grated Cheese and serve warm with Cornitos Chunky Salsa.